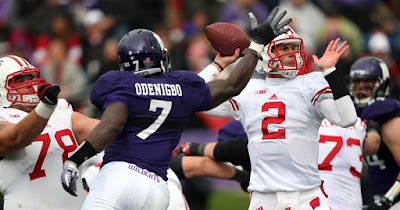 The Vikings have added strong competition to the defensive line and Ifeadi Odenigbo brings more potential to the group. Find out why Daniel House says developing his pass rushing moves will be critical. Updated: June 6, 2017 11:45 a.m. The Vikings drafted a one-year Big Ten starter with one of their four seventh round draft picks. Defensive end Ifeadi Odenigbo produced in his final season at Northwestern, notching 10 sacks and 12 tackles for loss. He led the Big Ten in sacks and finished second in program history with 23.5 total quarterback takedowns. Odenigbo did this despite being bit by the injury bug during the early portion of his career. He measures in at just 6'3", 258 pounds, but has won matchups because of his quick first step and burst. Odenigbo's timing off the snap gets the offensive lineman off balance at the point of attack. He often uses a strong long-arm jab to get position and wins the leverage battle as the offensive lineman is unable to get inside hand position. The clip below illustrates his quick first step, power, and inside arm strength to get the offensive tackle off balance. He also swipes across the quarterback to pick up a strip sack. There are frequent occasions where Odenigbo wins despite playing tall. He doesn't have fluid hips and struggles bending, which leaves me concerned about how he'll match up with more talented options at the next level. Even with his limited size, he can still win battles if he learns how to stay low and sink into his hips. His hip movement just doesn't look natural, which is something that worries me as he transitions to the professional ranks. However, he has great timing off the snap and uses his power to win battles. He also displays an occasional spin move in his pass rushing array. Nonetheless, I want to see him develop more pass rushing moves because he relies on bull rushing quite often. He has shown the potential to use an inside jab and spin move, but the vast majority of his passing rushing "wins" have come when he simply bull rushes the offensive tackle and wins with his quick first step. The clip below is an example of Odenigbo using speed, timing, and power to back the offensive tackle into the quarterback. With more focus on the details of Odenigbo's game, he has the chance to be a threat as a rotational pass rusher. However, I wouldn't be opposed to seeing him stand up as a linebacker in a few packages. In that case, I would worry about his instincts as a player. As a defensive end, it is clear to see he lacks the natural football instincts because of his limited experience. He needs more reps to continue feeling comfortable in live-action. Not to mention, the reps and work with defensive line coach Andre Patterson will help him develop more consistent pass rushing moves and footwork. Odenigbo also did a great job of causing the pocket to collapse, forcing quarterbacks to step into a frequent amount of backs. He bulldogs offensive lineman 7-9 yards into the backfield on a consistent basis. His speed and bulldog mentality as a player came alive on third down. In the clip below, Odenigbo wins off pure speed and a jolt of power as he gets inside hand position. This quick step Odenigbo displays gets him into trouble when teams decide to run the football. He often gets washed out of plays because he's too far up the field. In addition, he lost contain on a few occasions, which resulted in big plays. He plays fast and aggressive, but this can sometimes get him into trouble. Odenigbo must develop better instincts and awareness against the run. With limited length and size, Odenigbo will need to continue developing his pass rushing moves to win at the next level. He can't use just speed and power at the next level. However, those two aspects of his game will serve him well as he makes the transition to the NFL. He has shown flashes of potential and it will be fascinating to see the type of player he can become under the instruction of defensive line coach Andre Patterson. More importantly, he has a very energetic and driven personality, which will make him fun to cover in the future. One can see he plays with an extreme amount of passion and energy, which isn't the case with some players. In the future, I see Odenigbo being a player who is a pure rotational third down edge rusher, but he will need to adjust to the rigors and demands of the NFL first. Looks a little like Everson in those clips.